17 year old Leeann Worthier is the prettiest girl in town-or so she says. George Willets is the heir to a booming petroleum business, George's controlling mother is unimpressed, and Leeann absolutely refuses to live with her mother-in-law. So George gives his wife a house as a wedding gift. Thirty years before, the same house hosted a grisly scene: George's uncle and cousins were all slaughtered, and his aunt Robina accused of both murder and suicide. 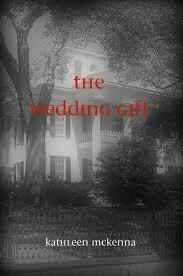 The Wedding Gift is told by Leeann, the prettiest girl in Dalton. You can't help but love Leeann, as conceited and big headed she is, she will crack you up! She is hilarious and her best friend Jesse is even more so. The characters were fantastic, I had a love/hate thing going on with them but they all entertained me, even Miz Bethany. I would love to spend a holiday with the Worthiers and Jesse, what a great time that would be! The plot gave me the creepy, spine tingling feelings. I hesitated picking the book up while home alone because it did spook me but I loved that, the author did a great job delivering the horror. This book has something to please everyone, if your not a fan of the horror genre I urge you to give this book a try, you may surprise yourself, I know I did. It's a crazy, entertaining ride. You'll be flying through the pages dying to know what is going to happen next. Kathleen McKenna really delivered with The Wedding Gift, it's not your typical ghost story, she puts a incredible spin on things. If your looking for a fun, thrilling read, then get yourself a copy of this book. You will not be disappointed! I read and reviewed this book a few months ago and loved it.